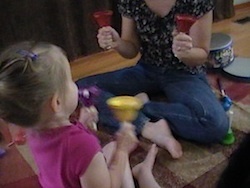 miamivalleymusictherapy.com - What Is Music Therapy? Music therapy is the use of music to accomplish non-musical goals. Our aim is not to teach the client to play an instrument, nor does the client need any previous music training. Instead, music therapists use music to help the client achieve growth in communication, cognitive skills, social functioning, emotional well-being, and physical ability. Because music can access all of these areas, it is an effective tool to address the health of the whole person, assisting to integrate skills on all levels of functioning. During initial assessment sessions, the therapist introduces a variety of music instruments and experiences to observe the client's responses to music. We often use guitars, pianos, drums, and many small percussion instruments. The client is encouraged to actively participate in singing, song writing, music improvisation, instrument playing, dance, and movement to music. Charles, a client on the autism spectrum, has limited verbal language and is reluctant to use his voice, whereas in music therapy he is motivated to sing and experiment with speech sounds and word approximations in song lyrics. Max, a child with Down Syndrome, is socially withdrawn and will not engage in play with his peers. However, in music therapy he is supported by the predictable structure of the music and will initiate eye contact, offer appropriate social greetings, share, and take turns in instrument playing. Darcy, an adult with cerebral palsy, is unmotivated to use her hands functionally to reach for and grasp utensils at home. In music therapy she will reach and independently grasp mallets to play the drum building muscle strength and motor memory that she can generalize to self-care skills. Cameron, a school aged student, has difficulty remembering the sequence of the letters of his name. In music therapy he and the therapist write a song together that provides him with a container to organize the information and retrieve it as he sings the melody. Music therapists work with a wide variety of individuals in schools, hospitals, neonatal intensive care units, correctional facilities, continuing care centers for older adults, hospice programs, mental health facilities, and agencies serving those with developmental disabilities. All of the therapists at Miami Valley Music Therapy have a Bachelors degree in music therapy, as well as national board certification through the Certification Board for Music Therapists.